for some time, I've gotten a lot of first-hand experience with having huge quantities of fruit in my home. There's frequently over 100 pounds sitting around at any given time. Eating raw isn't like eating cooked food. Someone who eats cooked food can head to the supermarket, buy a bag of potato chips, and chow down as soon as they've paid for it. If you're a raw foodist and go to that same store and find all of the fruit unripe, you're going to be hungry until you let it ripen. The fast food mentality doesn't apply to fruit, so it's critical that you learn to plan ahead so fruit ripening has enough time to occur. 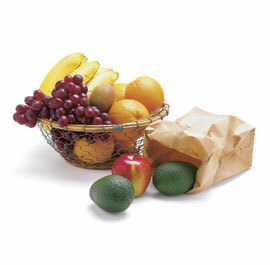 Fruit ripening is largely caused by a plant hormone called ethylene, which is a gas. Most fruits give off ethylene in ever increasing quantities as they ripen, and we can use this to our advantage when ripening fruit. Ethylene production increases as temperature rises, which is why you may have noticed that your fruit ripens quicker in the summer than in the winter. The fridge can be used to slow down ripening considerably. Conversely, heat speeds things up. How Do You Know It's Ready? One of the people who said this to me was eating a banana with her lunch that still had a fair bit of green on it. Though the majority of Americans may consider this a good banana, it's far from it's ripe ideal and can cause constipation and other digestive problems. The body runs off sugar. Anything you eat that's not sugar must be converted into it by the body before use. Fruit's ripening process, then, is essentially predigesting food for you. A green banana with some yellow is 80 percent starch and seven percent sugar. A spotted and specked banana is five percent starch and 90 percent sugar. Bananas aren't really ideal until they've got plenty of brown spots on them, but this is, ironically, when most people start throwing them away. Other fruits are sometimes eaten when they're unripe, but the indicators aren't as clear. By placing something like a brown-spotted banana into a sealed paper bag with green bananas, the gas produced by the ripe banana will speed the ripening of the unripe bananas. You can also mix up fruits by, for instance, ripening tomatoes with bananas. So say that you just bought yourself an entire box of green bananas. You want eat some soon, and others later, and realize that if they're ripening at the same pace you'll be hit with more fruit than you can eat all at once. The key is to use what you know about ethylene to your advantage. As I mentioned in my fruit storage article, putting fruit in a warm spot will speed up the ripening process. I have a utility closet that's always warmer than the rest of the apartment, so I stick my fruit in there to ripen. Also remember that heat rises, and so higher areas will tend to ripen before lower ones. If you have a cool spot, like a basement, fruit stored here will generally ripen at a slower pace. Note: Refrigeration sometimes effects the taste of fruit, so it's better to eat things fresh. Apples: Stick them in the fridge after you've picked them to keep them from going mushy. Apricots: If they're not ripe, store them in a paper bag. Once they're ripe, eat them within a day or two. Berries: Berries can be hard to manage, and are very perishable. Take out any overripe berries and eat them immediatly or throw them away if they've gone bad. If any are smashed or moldy, immediatly throw them out. You can keep most berries for 3 or four days, but watch them close for signs of decay. Fresh blueberries are an exception and often last 10 days. 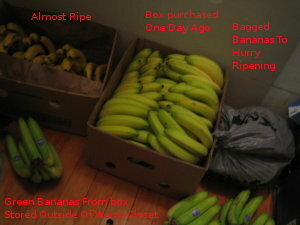 Bananas: See above section, but after becoming very spotted bananas can be stored in the fridge for at least another week. The peels may turn black but the fruit will stay good. Cherries: If they're in good condition, they should last about a week. Remove any that have started to go bad. You can keep them in the fridge for a few days if necessary. Dates: Dates will be perfectly ripe when you get them. They can be stored in the fridge or at a cool temperature for a long time. I usually eat the dates I get within a few weeks, so I'm not quite sure exactly how long. Grapefruit: These can be kept at room temperature for perhaps a week, and will taste better when not chilled. If you want to keep them longer, put them in the fridge and you can get seven weeks out of them. Grapes: Pick over any grapes and get rid of the smashed ones. If you're not eating them immediatly, you can keep them in the fridge for 4-6 days. Kiwi Fruit: Kiwis can be ripened with the ethylene gas of other fruit, but once ripe keep them away from the other fruit, because they'll quickly become overripe. Once ripe they can keep for a week in the fridge. Lemons and Limes: Lemons will last about two weeks at room temperature, but limes should be refrigerated as soon as you bring them home if you're not going to use them quickly. Mangoes: Mangoes will sweeten best at room temperature. They're ripe when you skin is pliable enough to peel easily with your nail and finger. The skin should be easily pulled off the flesh. I've kept ripe mangoes for up to 5 days in the fridge. Oranges: Oranges are as ripe as they'll ever be when you pluck them from the tree. They'll last a few days at room temperature of a little over a week in the fridge. Papayas: Best ripened at room and stored at room temperature. Learn to pick out a good one here. Pineapples: Best ripened at room temperature. Figure out how to pick good ones here. Plantains: Read the plantain ripening guide here. 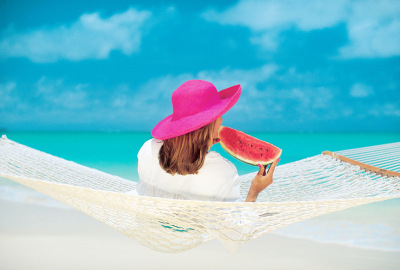 Watermelon: Watermelons needs to ripen on the vine. Learn about picking good ones here. Once you get it home, you can keep it uncut at room temperature for up to two weeks without any problems, but putting part of it in the fridge for a day or two is fine. Learn more about fruit ripening in the fruit guide. Find great uses for your fruit in the raw food recipes section.